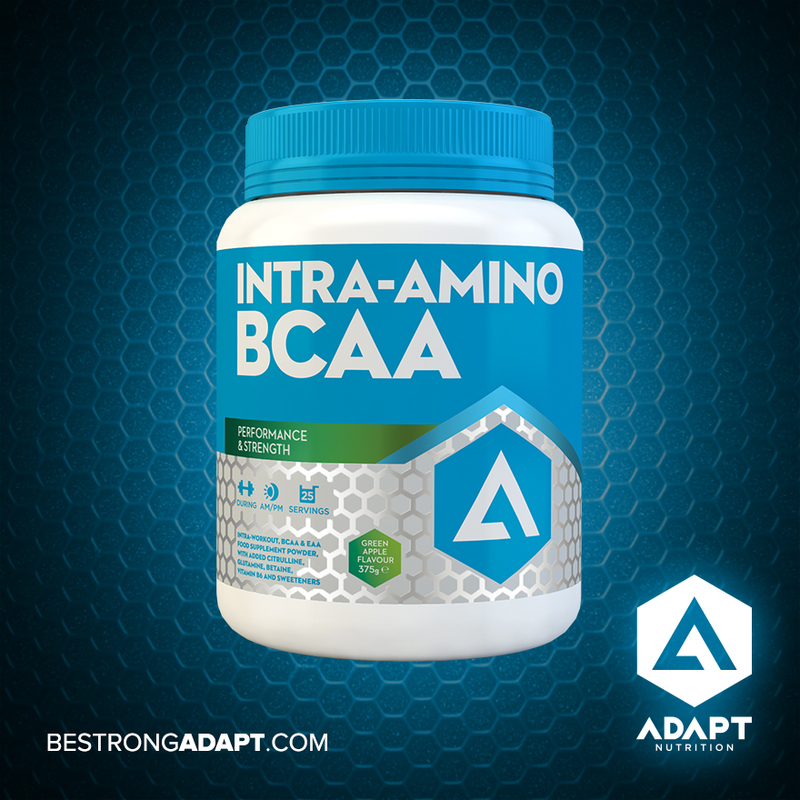 Adapt Nutrition Intra-Amino BCAA is an Intra-Workout supplement containing over 13 grams of Amino Acids, 8 grams of which as Essential Amino Acids. Histidine, Isoleucine (BCAA), Leucine (BCAA), Lysine, Methionine, Phenylalanine, Threonine, Tryptophan, Valine (BCAA) are Essential Amino Acids meaning that they cannot be synthesized or made from scratch by our bodies. We need to consume them from our food. Of those 9 Essential Amino Acids, Isoleucine, Leucine and Valine make up the 3 Branched Chain Amino Acids (BCAA’s) that are commonly found in many Sports products. So remember, BCAA’s are contained in EAA’s but BCAA’s are just a third of EAA’s. Got it? So which is best to take, a product with just BCAA’s or a product with all of the EAA’s? All 9 EAA’s are by definition essential for the body. By using a standalone BCAA product you are missing 6 of the EAA’s the body requires for optimal strength and recovery. BCAA’s are the most important EAA’s for energy production and muscle metabolism (protein synthesis), hence their hype in bodybuilding products and marketing. But using a BCAA product is like playing a game of football with a goal keeper, centre-half and striker. They are 3 very important positions, but you need the other players to complete the team. (Football is 11 players we know but we are sure you get the analogy). Using a complete EAA based product will not only give you the performance benefits of BCAA’s it will also maintain lean muscle tissue, fight fatigue, improve immunity, speed-up recovery and repair. You need all of the Essential Amino Acids and the Essential Amino Acids contain BCAA’s. BCAA’s got a lot of industry momentum because they were very marketable. EAA’s offer many added benefits over just BCAA’s. L-Citrulline Malate – Supports muscle blood flow, promotes muscle strength & power, supports muscle energy. Vitamin B6 – Supports a healthy nervous system, promotes amino acid absorption, increases energy and absorption. Electrolytes (Sodium and Potassium) – Promote electrolyte balance, support hydration, reduce tiredness and fatigue. Whatever your sport, be it training in the gym, cycling, running or rugby, the benefits of using IntraAmino BCAA should now be clear. Train harder, for longer and recover faster! Intra-Amino BCAA has no cheap fillers, is free from all carbohydrates, contains only natural colours and is available in Apple & Pineapple flavours.